The ozone level has been rising in Bexar County, according to the American Lung Association, which gave the county a failing grade for its air quality for the 14th year in a row. And while cars and power plants are the top two sources of air pollution, CPS Energy has reduced emissions that contribute to ozone by 70 percent, as part of its larger strategic energy plan. Over the last three years, Bexar County has averaged almost 6 days a year when ozone is harmful to sensitive groups like the elderly or asthmatics, according to this story in the San Antonio Express-News. Ozone is formed when emissions from sources like cars, power plants and other industry mix with heat and sunlight. Higher daily ozone concentrations are associated with increased asthma attacks, hospital admissions and even deaths. In San Antonio, cars make up the largest single source of air pollution, according to the Alamo Area Council of Governments, which coordinates efforts to improve air quality for a 7-county region. Power plants rank second. In this area that means CPS Energy, which owns coal and natural gas plants. While providing affordable, reliable power is CPS Energy’s number one job, it has also long made emissions reduction a priority. In fact, even as it has added coal plants to its generation fleet, CPS Energy has lowered nitrogen oxide emissions, a component of ozone, by more than 70 percent since 1997. Since 1999, CPS Energy has spent $246 million on environmental controls for its coal units; another $6 million is being invested this year to install additional mercury reduction controls. 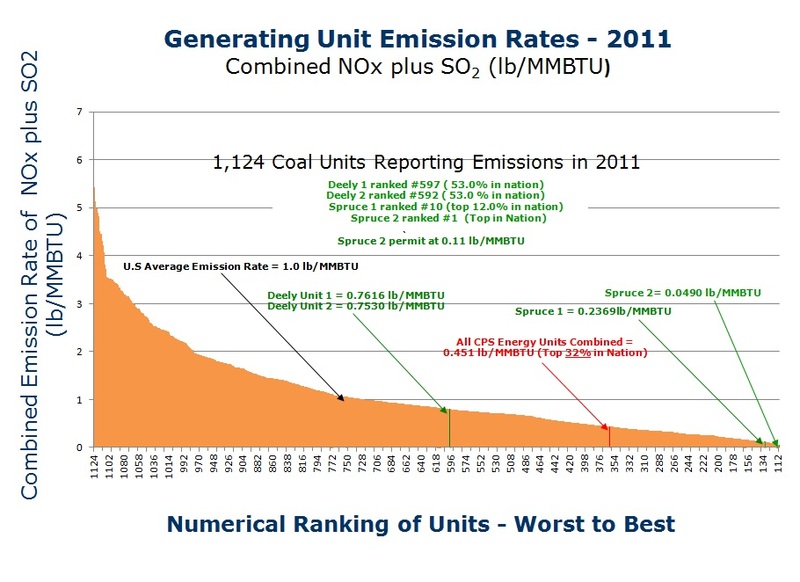 Spruce 2, the utility’s newest coal plant, was built with state-of-the-art emission control systems, and today ranks tops in Texas, and among the best in the country for combined NOx and sulfur dioxide emission rates. Reducing plant emissions is just one part of CPS Energy’s Strategic Energy Plan. Retiring our two oldest and dirtiest coal plants earlier than planned, and replacing those megawatts with cleaner-burning natural gas. Officials say they’re unsure why ozone might be increasing in San Antonio. Cars are becoming more energy efficient, but there are more on local roads every day. The drilling boom in the Eagle Ford shale, just south of Bexar County, could also be a contributor. AACOG is studying those possible effects. CPS Energy sits on several AACOG air quality committees, to help coordinate policy and outreach to the community. Thanks to CPS and San Antonio’s vehicles getting more cleaner burning every year, our contribution to ground level ozone (NOX and VOCs) is diminishing. Unfortunately, we cannot control the weather and outside sources, that inflate our ozone levels for a handful of days per year. I have been researching ground level ozone for over ten years and am now a member of the AACOG Air Advisory Committee. Based on my research, San Antonio’s high ozone days only occur after our winds have blown from the NE and East for a couple of days. Without outside influence, San Antonio would not exceed the EPA 8hr ozone standard. PS: The American Lung Association gives almost every medium and large city in the country an “F” rating. I am convinced they do this for annual “PR” purposes to bolster their organization’s membership. Their grading scale is so difficult to achieve it is almost impossible to score an A unless you live in a totally remote area.